An important part of the maintenance of the property you own is keeping the guttering system cleaned and functional. Our company provides effective and thorough removal of leaves, debris, rocks, moss and dirt from downpipes, soffits and fascias. 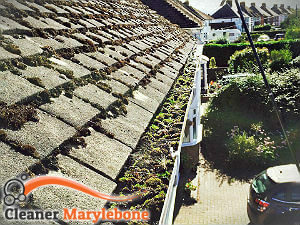 Use our services once per year or oftener to receive professionally and effectively implemented gutter cleaning in Marylebone or nearby and you will be pleased with the result. Our gardeners carry out hoovering and removal of the blockages using special equipment of dry and wet vacuum cleaners, telescopic poles and CCTV cameras. They work every day of the week including at the weekends and in the evenings without any surcharges. If the property which you own or let out needs cleaning of the gutters, call us to schedule the service and our staff will provide it. The work is conducted with the help of advanced equipment of machines and telescopic poles made of carbon fibre which can be extended to the desired height. 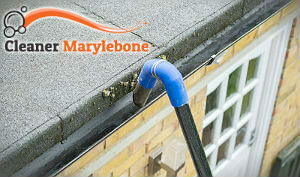 Use our call centre to receive effective and professional gutter cleaning which we offer in the W1U areas and nearby. Our services will ensure the effective and safe functioning of the downpipes and gutter components of your rainwater drainage system. They are provided at competitive prices and can be booked for the most convenient to the customer day and time. Every homeowner can take advantage of the services which we provide to remove blockages and dirt gathered in the pipes of their gutters. Our gardeners have cleaned plastic moulded, steel, cast iron and many other types of gutters, modern and traditional ones, using the the most effective equipment for this purpose. Leave the gutter cleaning to our specialists in this work who operate in Marylebone, W1U and you will be pleased with the final results.